While AIDS has been demoted as a treatable virus with its patients remaining active in Western societies, not all settings have achieved these shifts. Together with the struggles of modernity The Forgotten Kingdom captures the societal unease of AIDS while a young man reluctantly reacquaints himself to his indigenous culture that his AIDS-afflicted father had taken him from. The film features two forgotten kingdoms: that of Joseph’s native clan and instincts and the forgotten AIDS patients who are “cursed,” doomed, and marginalized. Joseph (Zenzo Ngqobe) or his native name Atang, returns to his home village in the country of Lesotho after his father dies from complications from AIDS. Joseph acknowledges that he was ripped away from his life in Lesotho when his father contracted AIDS, sent to live in South Africa’s capital. He has been absent through much of his father’s illness and the culture that he was born into had disappeared in his eyes. After his father’s funeral, he is re-introduced to a forgotten grade school crush, Dineo (Nozipho Nkelemba), whose sister is also struggling with the virus. When Joseph expresses interest in marrying Dineo, her father blocks the marriage due to Joseph’s inability to pay the bride price. When Dineo’s family moves north beyond the mountains Joseph sets out to find her and re-integrate into a culture and ethic he had lost. During Joseph’s father’s funeral, everyone arrives wrapped in colorful, patterned blankets, with Joseph himself wearing his dusty, thread-bare suit and tie. It is among many moments where he sticks out and expresses a reluctance to return to traditions. Then again, he has been away from these traditions for so long, but some instincts remain. During his journey during the second half of the film, he begins to reminisce over some sheepherding methods to a young sheepherder, only to realize that the methods have not changed over the years. When Joseph arrives in Lesotho, he befriends an unnamed child who eventually becomes a guide for his journey across the mountain. Over time, this guide becomes Joseph’s own Sancha Panza, providing earthly guidance and proverbs—sometimes ignored by Joseph—as well as some well needed comic relief in a film that is floundering in depression and misery. Yet, Joseph is no Don Quixote; he has no romantic feelings or any sense of idyllic assumptions towards his indigenous culture. The Forgotten Kingdom features a gorgeous palette of both subdued and bright colors, and the film’s initial shot is a lone sheepherder standing atop a cliff looking out into the pristine horizon. This image has a painterly style that captures the closeness that Joseph’s native culture has with the land. The rest of the film, save for the early scenes in Johannesburg, has a classical feel, where the film is told visually with cinematography that matches the existential crisis and the return to romanticism. 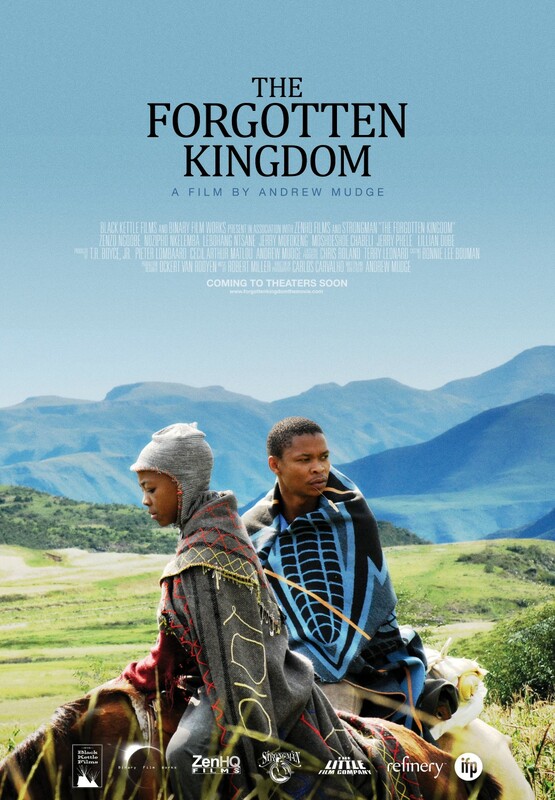 The struggle between modernization and native culture is commonly portrayed in cinema, but The Forgotten Kingdom places it in a contemporary South Africa and Lesotho. Without embellishing the theme, Director Andrew Mudge has created a passionate and light-hearted account where re-integration provokes a coming-of-age experience, one that would have turned Joseph into the responsible man he would have become if not forced out by his father.